More than half a decade after people across the Middle East poured into the streets to demand change, hopes for democracy in the region have all but disappeared in a maelstrom of violence and renewed state repression. In False Dawn: Protest, Democracy, and Violence in the New Middle East, Steven A. Cook, Eni Enrico Mattei senior fellow for Middle East and Africa studies at the Council on Foreign Relations, explains why the Middle East uprisings did not succeed. Despite appearances, notes Cook, there were no true revolutions in the region six years ago: none of the affected societies underwent social revolutions, and the old structures of power were never eliminated. Egypt remains an authoritarian state, Syria and Yemen are in the midst of civil wars, Libya has descended into anarchy, and the self-declared Islamic State remains a threat. Even Turkey, which was once thought to be a democratizing model for the Arab world, now more closely resembles an autocracy. A bimonthly newsletter featuring recently published books and reports from the David Rockefeller Studies Program. “Looking back, it all seems dream-like. . . . Egypt’s Facebookers and bloggers, Mohammed al- Bouazizi, Khaled Said, Tahrir Square, brave Libyan fighters advancing on Tripoli, the Girl in the Blue Bra, and Gezi Park’s girl in the red dress are of a recent but seemingly distant past—a gauzy sequence of determination, defiance, hope, and activism that has not been extinguished as much as eclipsed by political uncertainty, instabil­ity, and at times unspeakable violence,” he concludes. As one who frequently hosts programs about the Middle East and talks to all the players, I have wanted to know how the Arab Spring came and how it went with such speed since 2011. If journalism is the first draft, it’s time for the second. In False Dawn, you meet the characters and ideas that fueled the fast moving events of the Arab Spring. Steven Cook serves as a deft guide to helping you understand the factors that ground it to a halt. 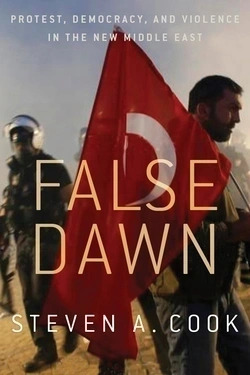 Steven Cook is one of Washington’s most astute and informed observers of the Middle East, and anyone wanting to understand how the region has ended up in its current unraveling state would do well to read his new book False Dawn. The backlash—and Western misreadings of it—are all too real, and Cook’s book is a major contribution in understanding what we got wrong. In this incisive book, Cook has masterfully applied the tools of the social sciences to separate fact from fiction in explaining how that moment of hope in the region turned into calamity. Intelligent and well-written, this is a must read for anyone interested in understanding the tumult that is unfolding in the Middle East today. Steven Cook’s latest work offers a smart and analytically compelling explanation for why the events of 2011 were bound to fall short of the promise and hopes they raised. Even those who may not fully subscribe to his policy prescription will profit highly from reading this very well-constructed and thoughtful book. Steven Cook gives one of the best detailed accounts about the hope that was there and then never fulfilled. A must-read book for anyone who wants to know what happened and doesn’t want to get second-hand information from pundits. The promise of the ‘Arab Spring’ now seems a distant memory. False Dawn offers a sweeping account, a combination of on-the-ground narrative and deep historical analysis of what went wrong. Steven Cook’s excellent book opens with a quote from deposed Egyptian leader Hosni Mubarak in 2011 that seemed like a threat at the time but now reads more like a prophecy: ‘The youth who called for change and reform will be the first to suffer.’ Cook tells us why. Steven A. Cook has prepared an insightful account of recent developments in certain key countries. Drawing on his in-depth knowledge of both historical and contemporary developments in the region, Cook identifies what he sees as the primary factors at play in recent upheavals and clarifies why certain revisionist theories of these events do not obtain.